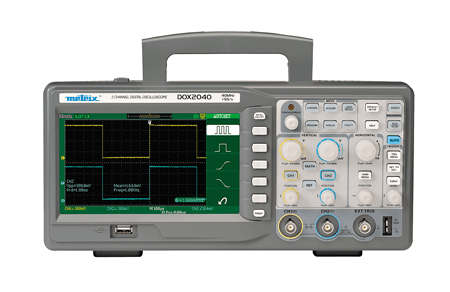 The METRIX® DOX2000 Series oscilloscopes are particularly compact and simple to use, with a casing specially designed for laboratory use. They are equipped with a wide display offering 18 div. in full-screen mode. This allows customization of the display: choice between normal or persistent display, YT or XY format, adjustment of the colours, graticule, brightness, contrast, etc. Rotary buttons and backlit keys give access to the commands on the front panel. 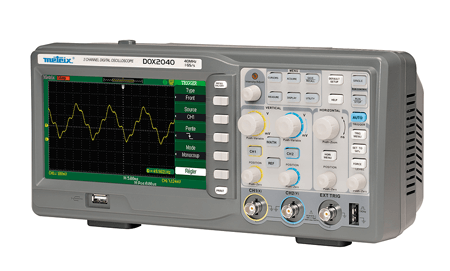 With its handle, the DOX oscilloscope is easy to transport and its non-slip feet make it particularly stable. There are 3 acquisition levels for acquisition and analysis, in real time or equivalent time. The memory depth for acquisition is 32 kpoints or 2 MPoints to optimize your analyses. The vertical sensitivity is from 2 mV/div. to 10 V/div. with 12 ranges and the horizontal sensitivity is from 2.5 ns to 50 s/div. Advanced functions are also available: simple MATH functions (+/-/x/÷) and “real-time” FFT with simultaneous display of the traces. The EASYSCOPE software delivered with the product can be used to control and test the oscilloscope and to recover the trace and screenshot files. 2 x 40 MHz channels – Sweep speed from 2.5 ns/div. to 50 s/div.